Greenpeace has released an interesting report on fourteen projects that could increase greenhouse gases emissions by 20 percent by 2020. This would lead to an increase of temperatures by five or six degrees Celcius. 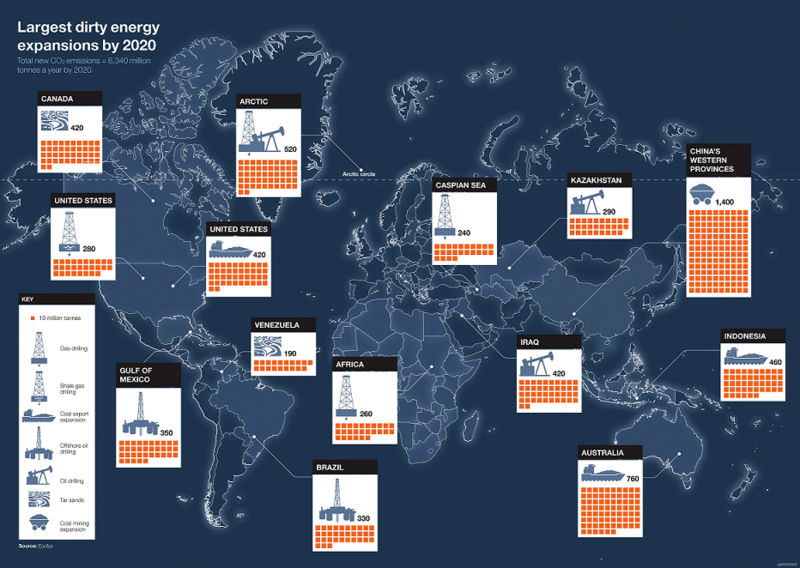 The largest threats are China and Australia as they plan to increase their coal productions. This is particularly ironic as Climate Progress report that these two countries are particularly hit hard by climate change and air pollution. I hope we will be able to defuse all of these 14 bombs before they blow us all up. In today’s article we will have a look at them and how we can defuse them. The amounts on each lines are thousands of tonnes of carbon dioxide these projects could emit by 2020. Yep, we are talking about gigatonnes of CO2. Grist notes that out of the six biggest, four concern coal. If you thought that the dirtiest fossil fuels of them all was going down because of its dirtiness, its human cost, its toll on our air and water, you were heavily mistaken. The IEA recently published a new study showing that coal will be the leading energy source in the world by 2022 due to the demand from India and China. Woooops ! Coal has been known for years for being the first environmental enemy. But our voracious appetite for economic growth at all costs is undermining our efforts to save our civilization. I hope our leaders and representative will understand that making money on killing yourself is not the best business idea you can get. I hope they will have this enlightenment BEFORE it is too late. Back to these 14 carbon bombs, We, the People will have to rise and FIGHT against them. The famous Sierra Club has called for civil disobedience to stop the Keystone XL pipeline. I guess they are showing us the way. Local action will have to be started and keep on growing. If the KXL project has been stalled until now, it was by peaceful protest. the Mahatma Gandhi, Martin Luther King Jr and Nelson Mandela all succeeded by peaceful protest. All their ideals seemed ludicrous at the time. Yet, they succeeded. Time has come as it is literally now or never. This decade will either go down in History as the time as We, the People rose to demand climate action or as the one where we sat down while explosive charges were installed to blow up our global civilization.